19" by 21" with frame; signed lower right. One of the most prominent of American Tonalist painters, Dwight Tryon was born in Hartford, Connecticut in 1849, but lost his father in a gun accident at an early age. Though largely self-taught, he achieved enough early success painting in a Hudson River style to afford a trip to Europe in 1876. In France, he studied with Henri-Joseph Harpignies and J. B. Antoine Guillemet, but a decisive event in the evolution of his style was a summer spent studying with Barbizon artist Charles-Francois Daubigny. Upon his return to the United States in 1881, he took up residence in New York City. His search for more picturesque settings, however, led him to the fishing village of South Dartmouth, Massachusetts, where he summered and eventually built a small house. Among the artists he met in New York were Thomas Wilmer Dewing and Robert Swain Gifford, with whom he remained close friends. 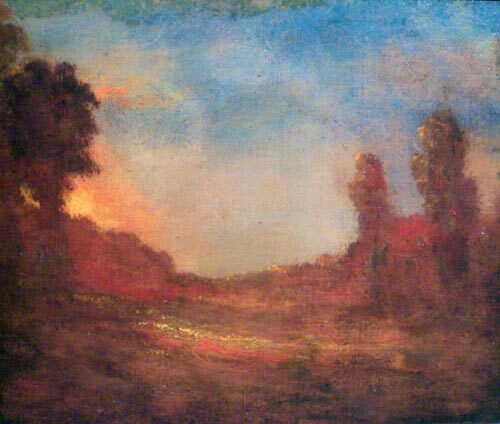 Like many of his Tonalist peers, Tryon preferred intimate and lyrical low-light landscapes of rather simple composition. In a statement quoted in a biography published shortly after his death, he summarizes the method which gives his work an uncanny dynamism: "Often in painting a bit of sky I will put blue on it and scrape it off; I will put pink on it and scrape it off; I will put yellow on it and srape it off; I will put green on it and scrape it off, and my sky will look almost white-but it isn't, for it will have in it the vibrations of all those colors." From 1886 until shortly before his death, he was Professor of art at Smith College in Northampton, Mass. His works were avidly collected by wealthy industrialist Charles Lang Freer and form a significant part of the Freer Gallery (Smithsonian Museum) in Washington, D.C. He also bequeathed a portion of his remaining work to Smith College along with $100 thousand to build a museum at the College. Among other major venues for Tryon's art today are the Metropolitan Museum, the Museum of Fine Arts, Boston, the National Academy of Design, the Butler Institute of Art, the San Diego Museum of Art, and the Pennsylvania Academy.